Set of 20 fitted disposable waterproof mattress covers for children's size beds or cots, available in three sizes: Thin Cot 60 x 120 cm, Short Cot 70 x 100 cm and Tall Cot 70 x 140 cm. New material, soft and very durable. Once used, you can throw them away or recycle them. "Ever Clean," they are wrapped in individual packaging. Perfect for hotels, motels, hostels, inns, B&Bs, day cares, unexpected visits from friends... Anti-allergic material, which is effective at preventing the spread and breeding of lice, bed bugs, bacteria and dust mites in mattresses. The plastic film is melded to the fabric to protect against spills and stains by creating a waterproof layer. If you prefer, we also offer non-waterproof fitted sheets available in the same dimensions and sizes. Fitted sheets are more proper than flat sheets and avoid disturbances in your guests' sleep. If you don't need waterproof coverage, please see our normal Fitted sheet. Quantity: 20 pieces, each wrapped in individual packing. 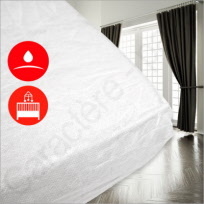 For larger bed sizes, please refer to the Nuideal Fitted Disposable, Waterproof Mattress Protection Covers. The best eCommerce software by ShopFactory powers P97. All-in one eCommerce and shopping cart software.